Set on the banks of the shimmering Bentota River, Apsara is a beautifully finished 3-bedroom villa just five-minutes from the beach. An excellent staff team plus top chef attend to all your needs so you can relax by the pool, savour the aquatic views and enjoy the villa’s luxurious facilities. West coast Bentota is famed for its long sweep of sandy beach and its first-rate water sports facilities but less renowned for its meandering mangrove-fringed river that snakes its way far inland. It is beside this mesmerising waterway that Apsara sits, not far from where the river enthusiastically empties itself into the sea. As it gazes over the shimmering surface of the river to the verdant riverbank across the way, three-bedroom Apsara quietly soaks up the tranquillity that this peaceful position brings. During the day, boats gently motor by,whilst in the distance neon-bright windsurfers can sometimes be seen traversing the choppy waves. Apsara makes the most of its riverside situation by having its living and dining areas at the front of the villa, and the three bedrooms more privately tucked off a courtyard just behind. 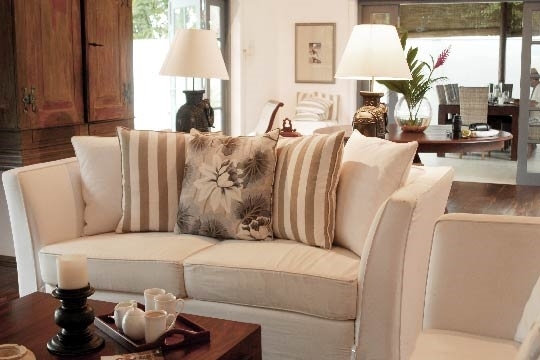 The villa’s interior design is striking yet simple and its overall finish is immaculate – as if brand new. Polished cement tiles in the bedrooms and exterior walkways are cooling on your feet whilst the timber floorboards of the living areas impart a warm, cosy feel. Wardrobes, ceiling rafters and pillars are painted blue but otherwise the colour scheme is light and earthy, making it easy to relax and unwind. The villa is furnished with a mix of contemporary and antique furniture, and the living room is air conditioned for comfort, wired for sound and facilitated with a wall-mounted HDTV with Blu-ray DVD player. 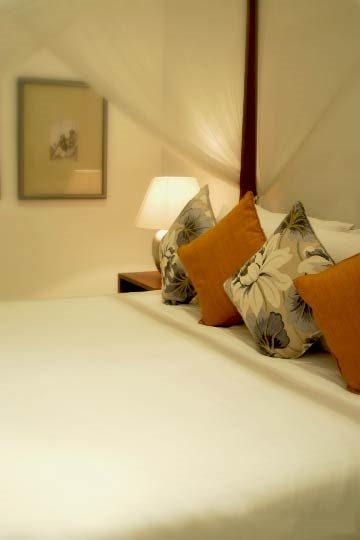 The bedrooms at Apsara are fairly equal in size and each comes with a four-poster king-size bed and ensuite bathroom. 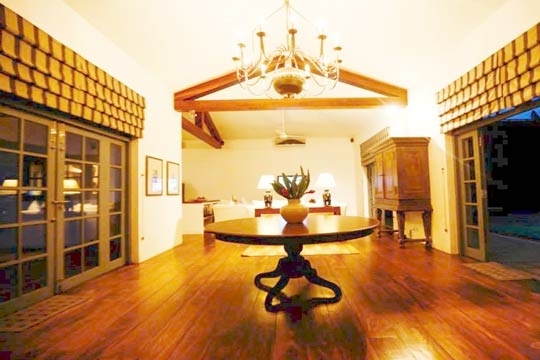 The dining area beside the living room is open sided and just footsteps from the emerald green lawn and swimming pool that languishes under the crackly shade of a stand of precious teak trees. Towards the back of the living room is an open-plan kitchen topped with marble from where Apsara’s chef cooks up the most fabulous cuisine all at a very economical cost-of-groceries price. 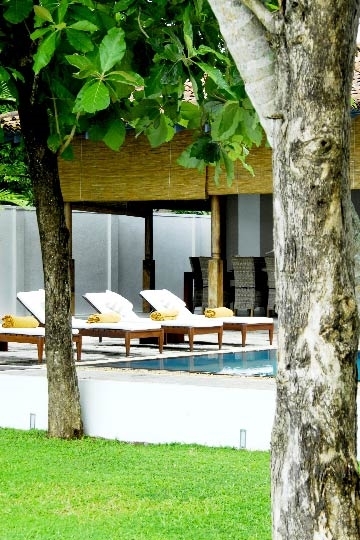 The staff are friendly and discreet, leaving you to enjoy the villa on your own as much as possible. The manager is a keen wind surfer and a fountain of knowledge on the local area, which boasts a wealth of opportunity from diving, fishing and water-skiing to inland bicycle rides, visits to fish markets and trips to ancient temples. It's hard not to love a chef who creates such incredible cuisine. 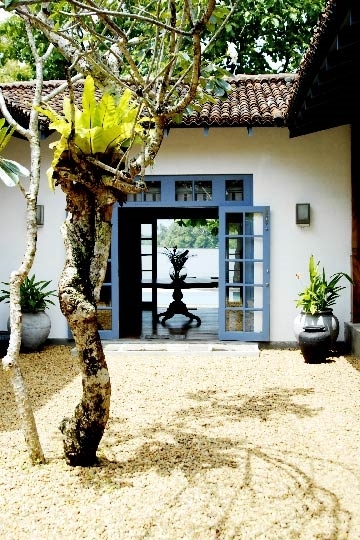 Apsara is situated in the village of Seeni Watta beside the Bentota River with stunning views out over this serene aquatic scene. By day, fishing and tourist boats traverse the softly shimmering water and sail around the headlands, where palm trees vie for space alongside feathery mangrove forests. 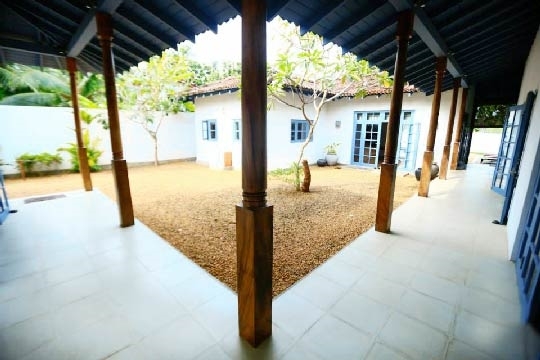 Beside the villa sit other private homes that share in the views and lead off from a road that takes you into Bentota via Aluthgama on the Galle Road. Within walking distance of the villa are a sky blue church and a fresh produce market that’s at its busiest on Mondays. Walk a little further and you’re in Aluthgama where a range of tourist shops, supermarkets and banks can be found. The beach at Bentota is just a five-minute drive or even shorter boat ride away. A pebble-strewn courtyard with fragrant frangipani tree lies at the heart of Apsara with an L-shaped pillared walkway giving access to the three bedrooms. Each bedroom comes with both air conditioning and ceiling fans, a four-poster king-size bed topped with cushions, built-in wardrobes offering ample storage space and ensuite bathrooms with powerful rain showers. The largest bedroom faces towards the living area and lake and comes with a cute cushioned window seat that looks into the private driveway (children under five could use the window seat as a bed). 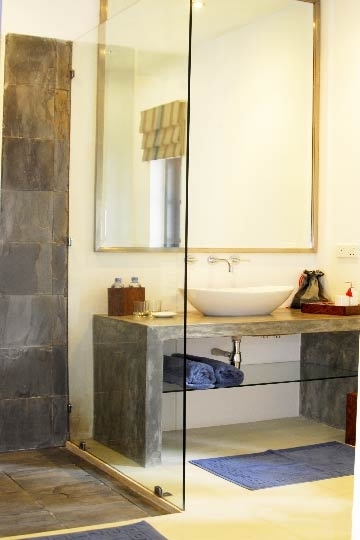 The second bedroom has the biggest bathroom and comes with twin sinks. To the front of the villa and gazing directly over the lake are the living and dining areas that lead onto the pool terrace and grassy terraced garden beyond. The dining table is situated to one side and has an open front so it feels as if you’re dining outdoors. A ceiling fan whirrs overhead. French windows lead from here into the spacious, open-plan, air-conditioned lounge and kitchen, with numerous sets of doors opening onto both the pool terrace to the front and the courtyard behind. The lounge features a wall-mounted LCD TV, a pair of white sofas that gaze out to the lake, plus a circular dining table with a stunning stainless steel chandelier hanging overhead. To the rear of the lounge, the marble-topped kitchen is kitted out with everything for the western cook. To the side of the house, tucked along a narrow walkway is a utility room with washing machine and tumble dryer that guests are welcome to use. A pool, framed by a stone terrace, lies just inches from the living areas and beyond it an emerald green lawn shaded by teak trees. A wooden deck and jetty are built out over the river beyond. 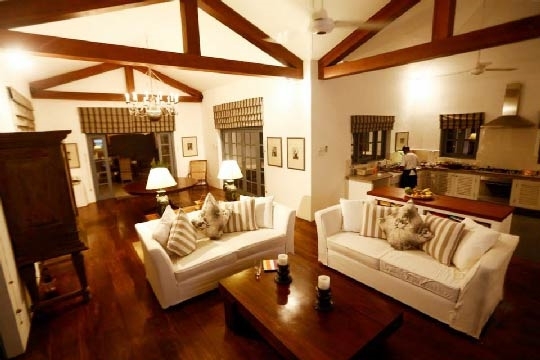 3 bedroom villa located in Bentota, West Coast. Ideal for Beach in ten, Kid friendly, Gastronomic delights, Fair share for groups, Romantic retreats, Room with a view, Walk into town.